Guide Alice through lavish backgrounds, charming characters, and exciting twists and turns on an old gaming favorite. 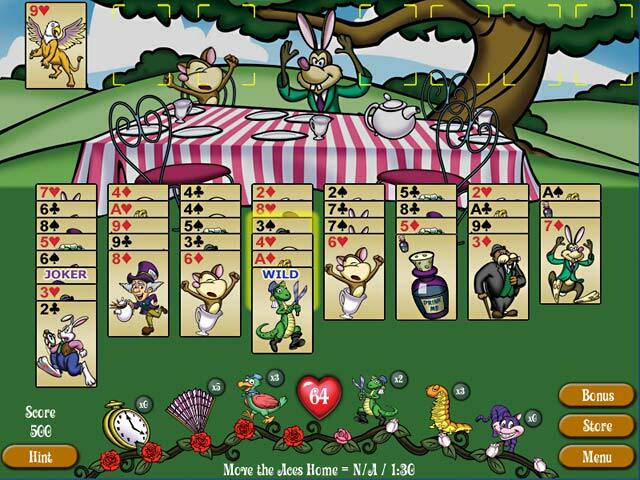 Have a cup of tea with Mad Hatter and play his special mini games. Be careful of the Cook’s pepper, one wrong sneeze and you might lose the game. Help rescue characters before the Queen chops off their heads. 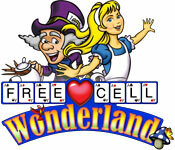 Special Missions, unique challenges and a never-ending variety of levels make FreeCell Wonderland a brand new experience for you to enjoy. FreeCell Wonderland is rated 3.7 out of 5 by 3. Rated 4 out of 5 by alsteele28 from Down the rabbit hole to a card game of wonder(land) There are at least three games on BF that depict this wonderful classic story. This game however is the only card version (to my knowledge), this is the classic 'freecell' solitaire card game with a twist. The version is faithful (in the main) to the freecell version of solitaire and there is even a tutorial if you are unfamiliar with this version (this helps and 'refreshed' my mind as to the principals of the game). The game itself is whimsical and quirky (much like the story) and takes you through the story of Alice in Wonderland. The way to complete each of the levels is to open up the 'rose' level meter by playing the game. It is not always necessary to 'clear the decks' as it were, to fill the 'rose meter' but each level has a certain amount of points that need to be achieved in order for that particular level to be completed. What was a bit confusing was that you may complete the points target for a particular level, but you may not have fully completed the 'rose meter' thus you had to to play another round within the same level, I was confused to start with as I couldn't work out if that if I had met the targets then why I couldn't move on to the next level, as I say I eventually worked it out. The game starts of with a 'baby' version of the game in that you only have to sort cards 4 through to 6, as you move on through the game though the number of cards increases (in the hour trial I got to number 7), this again was good as it slowly introduced you not only to freecell, but also gently eased you into the game itself. As with most solitaire card games on BF there were 'powerups' and columns that had to be 'unlocked' before you could use them (think sand bunker cards if you had played fairway solitaire), this again added to the overall challenge of the game. In between each of the levels (and sub-levels) a part of the story was told and as the story continued the story became the foundation for the missions for that particular level, this was another plus point (IMHO) as it made a solitaire game (which could be seen as slightly stale), a lot more interactive thus it held your interest. The only slight negative I found with the game was that there was a 'mad hatter' card that had different 'bonuses' during game play if you performed certain functions, the slight problem I had with this is that sometimes the information was little vague so I did not fully understand what was required in order to achieve the bonus (extra hearts, points etc), this was the only slight negative I found (and as there were several different types of bonuses it didn't detract from what was otherwise a good game), I would therefore highly recommend this game. Rated 4 out of 5 by geobabe1 from Fun game, not too challenging This is a fun game, though if you're looking for a high level of challenge, this will not be for you. It's more for those who want to just play without having to puzzle over it too much. 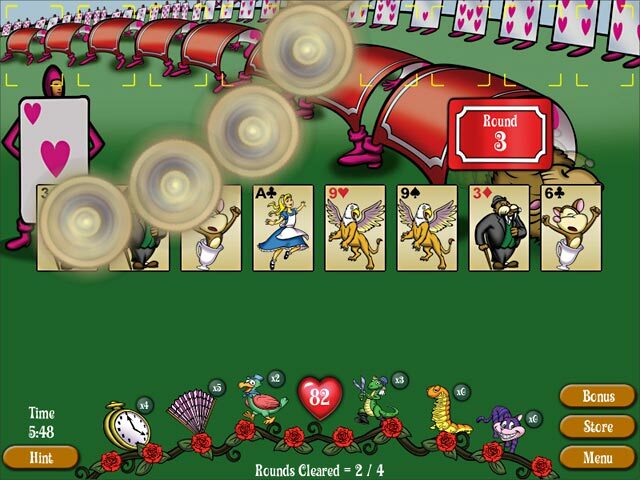 Most of the games are with less than a full deck of cards, and you get plenty of power-ups that make it pretty easy to win every game, though there are also challenges that you may or may not achieve, like finishing a round in under a set amount of time, or getting a certain number of special cards. The story is basically Alice in Wonderland, though there were some parts that I don't remember from the book, so I think they added a bit to the story. :) This would be a really good game for kids. 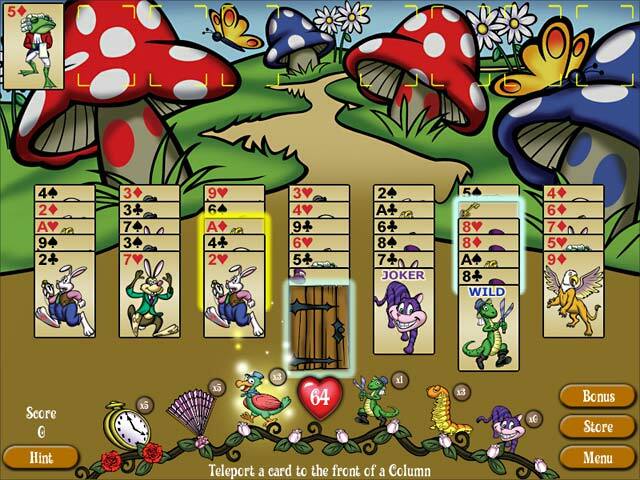 Rated 3 out of 5 by TeachumWell from This Wonderland Game May Leave You Wondering! At the outset, let me say it was a delight to find a card game not based on "Golf" or one of it's imitators. Thus I was ready to like the game even before starting the demo. The story was almost true to Louis Carroll's story but there the delight ended. The gameplay is very controlled, and while the instructions are detailed, they still left me puzzled as to how to maneuver and succeed in the levels. The deck, while good to look at artistically is difficult to read #for us older folks, anyway# when the cards are stacked in long columns. While I did manage to move up several levels in the demo I'm still not quite sure how I did it. There are several good game concepts here, but the devs tried to combine too many award and purchase factors/items to allow the game to flow smoothly. So, sadly, not a buy for me, but if you #like me# are a solitaire fan, give this a try as you just might find it your cup of tea. Guide Alice through lavish backgrounds, charming characters, and exciting twists and turns on an old gaming favorite!